Mae Moh escargots on UNESCO menu? Therdsak Jiamkijwattana, a political canvasser for PAO presidential candidate Udornphan Chantaraviroj, was shot at three times in what turned into a wild shootout at Chiang Mai Journalists Association building. 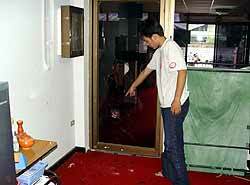 One of Therdsak’s staff points to the .38 revolver bullet holes in the Chiang Mai Journalists Association window. Therdsak survived the ordeal, and in fact didn’t even get hit, but did manage to pop off a few shots of his own, which he said chased the gunmen away. No one, either in or out of the office, was injured. The gun battle took place at around midnight on March 9. Therdsak told police that while he was starting to leave the building, he noticed 2 strangers wearing helmets and black clothes approach the building. He said the perpetrators threw a soda bottle at the door to break the glass, then began firing into the building. One shot hit the door, two more hit an office wall. The 37-year-old Therdsak said he responded by shooting back at them, which, he said, scared them off. However, during their getaway, the gunmen fired two more shots into the building. Astute Police Lt Col Wichien Charnwech, inspector at the Muang District Police Station, surmised that due to Therdsak being the main canvasser for Udornphan Chantaraviroj, a candidate for president of Chiang Mai Provincial Administration Organization election this Sunday, the shooting was most likely a result of political conflicts. However, the case is still open and during the continuing investigation, police will not rule out the possibility of business or personal conflicts. Therdsak owns the Chiang Mai Journalists Association building where the shooting took place, which is located in the Raming Nives Housing estate on Thippanet Road. 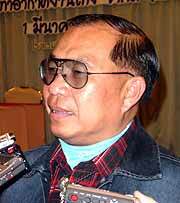 He is also the vice president of Chiang Mai Journalists Association, and the owner of Wihok Walkie-Talkie Radio Center. General elections for president and members of Chiang Mai’s Provincial Administration Organization take place this Sunday, March 14, and eligible voters are being urged to show up at the polls to cast their ballots. Perhaps to help encourage this, but more likely because it’s the law, sales of alcoholic beverages will be prohibited from 3 p.m. Saturday March 13 to 3 p.m. Sunday March 14. According to the election law, it is even illegal for restaurants to sell wine with dinner. It is also against the law for the press to provide an uneven amount of coverage for any particular candidate over the rest of the candidates, and this past week the local press was sat down in front of the Election Commission and reminded of their duties in this regard. Election Commission heavyweights organized and spoke at the meeting, including Kitti Prommarat, chairman of the Election Commission, Niran Kamsemanat, director of Chiang Mai Provincial Election Commission, Pol Major-Gen Pimol Sintunawa, Election Commission committee member, and Kanapol Pinkaew, permanent secretary of the Chiang Mai Provincial Administration Organization. Journalists were reminded not to make biased reports. Kitti said that the press is the most powerful and influential unit of Thai society, and that some journalists ignore the election law and report the news in a way that might affect some candidates. He said the seminar was held to provide a chance for election committees and news people to discuss election news and exchange opinions on how to report on it. Meanwhile, the election committees are working overtime to try and motivate as many people as possible to come out and vote. They have published 1 million leaflets to promote the election, and have produced tapes and CDs in all the local dialects to be broadcast on the many radio stations in the region. Kanapol Pinkaew, permanent secretary of the Chiang Mai Provincial Administration Organization, also said that the committee coordinated with Wing 41, which sent out helicopters to promote the election in mountain and boarder areas on March 11 and 12. So, if you happened to be in those areas and heard the copters buzzing around, that’s what they were doing. Polls will be open from 8.30 a.m. - 3 p.m. If Chiang Mai International Airport wants to be developed as the aviation hub, it must extend its runways, said Flying Officer Suthara Huangsuwan, the director of Airports Authority of Thailand (AOT), Chiang Mai branch. Flying Officer Suthara Huangsuwan, general manager of AOT, Chiang Mai Branch. Chiang Mai International Airport is located on an area of 14,275 square meters. To service the attempt to become an aviation hub, 114 million baht has been set aside to be used from January 20 to August 16 this year for expanding the airport’s building and lounge area for passengers and 2,129 million baht for developing the runways and surrounding areas. International arrival and departure lounges will be extended to hold 650 passengers and AOT will also provide another aero-bridge for the airport. Thai Airways International (THAI) and AOT have planned expending the runway by 300 meters into the northern part (Royal Thai Air force land) that will be enable Boeing 747-400 planes to land en route to London. The Air Force Engineering Department has been employed to make an examination of the condition and strength of the runway, while Southeast Asia Technology Co., Ltd. will study the environmental impact after the expansion. Mae Hia residents are protesting against expanding the southern section of Chiang Mai International’s runway to connect with the Chiang Mai - Hang Dong Highway. Currently there are nine airline companies operating in the airport including five domestic companies: THAI, Bangkok Airways, Orient Thai Airlines, Phuket Airlines, and Thai AirAsia, and four international companies: Silk Air, Lao Aviation, Mandalay Airways, and Mandarin Airlines. These international airlines make between 64-70 flights a day using the Chiang Mai airport, he said. During the year 2003, there were 15,774 arrival and departure flights, approximately 2 million passengers and 24,885 tons of cargo through Chiang Mai, returning a profit of 70 million baht for AOT. Flying Officer Suthara said that it is common for every company to be faced with problems when they start to do something new, and the Mae Hia villagers’ protests against the runway extension will be examined. AOT has assigned a consultant to study the villagers’ disagreement and carry out an environmental impact analysis covering noise, air pollution, traffic jams or land appropriation problems. He also said that the attempt to become a regional aviation hub does not depend solely on the airport, but also on the transparency of government policy, adequacy of accommodation, abundance of tourist attractions and effective campaigns to promote tourism to Chiang Mai. The theme for the Ninth Mekong Tourism Forum is, “Protect, Position and Promote,” which reflects PATA’s commitment to managing the reputation of Asia Pacific travel and tourism. Issues on the table at the Mekong Forum include product development and private-sector investment. Three breakout sessions will focus on the practicalities of the Forum’s theme. The Forum’s keynote speakers are Professor Kaye Chon and William E. Heinecke. An optional pre-Forum seminar on March 26 offers a hands-on learning experience as participants will have to deal with a crisis simulation. Chiang Mai resident Pisak Chinchai has many reasons to smile. But one of his biggest joys came last week when he became the very first person from Thailand to graduate with a PhD from a West Australian University. Chiang Mai resident Dr Pisak Chinchai became the first person from Thailand to graduate with a PhD from a West Australian University. He flew from Chiang Mai to Perth especially to attend the Curtin University’s Graduation Ceremony last Thursday. He received his Doctorate in Occupational Therapy with a Chancellor’s commendation for excellence. His achievement gave cause for celebration throughout the University. His academic supervisor Dr. Ruth Marquis who is Head of the School of Occupational Therapy said at the graduation that all of Curtin University would celebrate with him. She added that Dr. Chinchai had gone to extraordinary lengths to earn his Doctorate. 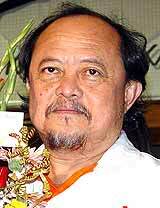 He had made considerable sacrifice in his pursuit to improve Occupational Therapy within Thailand. He was separated from his wife and young family over a four-year period to be able to study in Australia. Dr. Marquis went on to say that his happiness was contagious, and that his story inspires all who meet him to keep going, in an increasingly demanding environment. She explained that Doctor Chinchai’s study of people with spinal cord injuries in Thailand’s rural areas had the potential to make a significant contribution to the development of community based Occupational Therapy Services throughout Thailand. She concluded by saying that his research work looked in particular at people in remote areas of Thailand where they lack the hospital after care, health services, family support services, workplace rehabilitation and re-training that Australians take for granted. 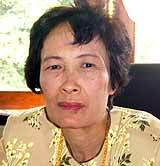 Dr. Chinchai now works as a Senior Lecturer at the School of Occupational Therapy at Chiang Mai University. Choke-amnuay Saipao, manager of Chiang Mai Waterworks Office, said that road improvements on the Chiang Mai-Lampang Superhighway, in front of the Juvenile Court, have caused water shortages in many areas around Chiang Mai City. 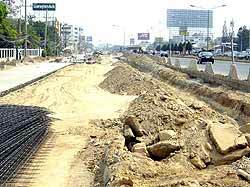 Road construction has caused a reduction in water supplies in Chiang Mai City. Kaew Nawarat, Tung Hotel and Khuang Singh areas are the worst hit. He explained that the road improvement has obstructed the large transfer pipe for tap water. They have connected a smaller diameter pipe as a makeshift effort, but this results in lower water volumes for the city. To solve the shortage, the office has requested additional funds from the Waterworks Regional Office 9 Chiang Mai to replace the large diameter pipe, said Choke-amnuay. At present, Chiang Mai Waterworks is transferring water from Mae Taeng and Mae Kuang dam to provide tap water in the Muang district areas, declared Somboon Konkaew, head of the Incomes Collection Department, Chiang Mai Waterworks Office. During this summer, it is expected that there will be water shortages in many areas. Waterworks is asking residents who are experiencing problems to contact the office, said Somboon. Sinchai Puengtambon, from the Upper North Royal Artificial Rain Making Center, said this year’s drought could be more severe than last year, caused by very slight rainfall. During dry season, he predicts the drought will affect 10 million rai, with 7.66 million rice farms and 2.9 million share crops throughout the country. The center has been cooperating with Chiang Mai Meteorology Center and other provincial centers in the North to observe cloud movements and relative humidity to suit the artificial rain process. As soon as the correct clouds and humidity are present, the center will start to produce the artificial rain. Already some organizations, agencies and farmers have requested the center to produce rain, because water resources in their areas are getting low. Every year, the center makes artificial rain during all seasons and for different purposes. The rain produced in the dry season is to provide moisture and prevent forest fires, in the wet season to produce water for specific planting areas and in winter to prepare the temperatures and humidity for production of the artificial rain in the next season. Chadam Ratchadakorn, head of the Water Distribution Division, Irrigation Office 1, said that this year the drought would be worse than previous years. During the past few months, there have been no reports of rain in irrigation project areas in Chiang Mai, Lamphun, and Mae Hong Son provinces. Chiang Mai Irrigation area has 11 medium reservoirs containing 23,402 million cubic meters, or about 66 percent of the reservoirs’ capacity. The reservoir at Phuphing Palace, which has a capacity of 25,579 cubic meters of water, contains only 7,465 cubic meters, or just 29 percent of its total capacity. Lamphun irrigation has four medium reservoirs that altogether have water volume levels at only 43 percent of their total capacities. However, water in the rivers and irrigation canals in Chiang Mai areas are currently at normal levels. In Mae Hong Son, the water level in main rivers like Nam Pai and Nam Yom are also still in the normal range. Water shortages are predicted for March since the water level is less than previous years, especially in Mae Kuang, Doi Saket district, said Chadam. Water shortages have already occurred in some areas in Chiang Mai and water pumps and water trucks are not enough to maintain supply. Farmers who began to plant during this dry season will be lucky to get enough water to maintain their growing crops. International Women’s Day was celebrated at Nawamin Tarachutit Payap School on March 6, with Chiang Mai Governor Suwat Tantipat presiding. The Chiang Mai governor also gave shields of honor to eight of the most outstanding women workers and 23 outstanding housewives in Chiang Mai. 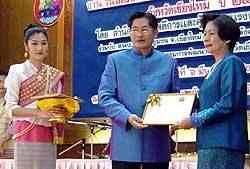 Chiang Mai Governor Suwat Tantipat presented a certificate to one of Chiang Mai’s most outstanding women. This celebration was held in advance of the world event on March 8, because officials in Chiang Mai province want each district to individually arrange their celebrations on March 8. In 1975, the United Nations decreed March 8 each year as International Women’s Day to encourage countries worldwide to promote sexual equality, provide opportunity for women to develop themselves, and encourage women’s participation in politics and international development. Chiang Mai’s population is 1.6 million, over half of which are women. “These days, many women associations have been established in Chiang Mai,” said Thipakorn Udommaneewan, head of the Provincial Welfare and Protection Office. Thipakorn also said that Chiang Mai’s work force is 47 percent female. Hundreds of women gathered at Chiang Mai’s International Women’s Day event at Nawamin Tarachutit Payap School. Governor Suwat said that we have to accept that women today have a great responsibility in both their families and society. He would also like to see men celebrate Women’s Day to strengthen their understanding of the new dimension in women’s roles. Work progressing at a snail’s pace? The ministries concerned have agreed to take back a 43-rai area containing fossilized freshwater snail shells from the Mae Moh Electricity Generating Authority of Thailand’s (EGAT) concession area in Lampang. Athikom Supanpong, Lampang’s deputy governor, said that the Cabinet approved a Natural Resource and Environment Ministry proposal to appropriate the 43-rai area containing the 13-million-year old snail shells. Natural Resource and Environment Minister Prapat Panyachartrak announced the area will be preserved and will be promoted as a new tourist spot. The ministry will also ask that the area be given UNESCO’s world geological heritage listing. Mae Moh EGAT last year found the snail fossils 12 meters under the coal seam and excavated the area to find fossils in an area 150 meters wide and 200 meters long. 200 SME owners attended a ceremony last week at the Chiang Mai University Convention Center to promote the new Handicraft Smart Enterprise project. The Industrial Finance Corporation of Thailand (IFCT), the SME’s Bank, and the Board of Investment (BoI) are all involved in the venture. Dr Somkid (center) presided over the contract signing ceremony at the CMU Convention Hall. Deputy Prime Minister Dr. Somkid Jatusripitak said that in the past, people viewed SME’s as small units, but these days the importance combining SME’s is being realized. However, in the future, SME’s have to apply new technology and packaging techniques. Most importantly, SME’s have to make their products respond to the demands of the international markets. Dr. Somkid continued, saying that current exporting statistics suggest that SME’s export capacity is generally good, but there are still some risks because many enterprises like to produce the same kind of product. This creates high competition among SME’s themselves, which could be counterproductive. Dr. Somkid also suggested that the Lanna Industry Union, which produces handicrafts, should cooperate with associated organizations to promote its handicrafts internationally. Universities should also provide personnel who are keen in developing the country’s industry and technology. Thai people have to support Thai products instead of imported products to sustain SME’s growth, he said. Jutamas Siriwan, the governor of Tourism Authority of Thailand (TAT), has stated that Chiang Mai would organize the Grand Lanna Songkran Festival during April 2-11. The highlights of the festival will be presented at the opening ceremony on April 2 and on April 9 there will be a procession along the main streets. During the festival, Chiang Mai City will have a light and sound show, wonderful fountains and traditional Lanna performances to celebrate the Songkran festival. Overseas cable channels such as INN, CCTV, and NHK, will televise the festival, said Jutamas. The main venue will be around the city’s moats but the light and sound show will be set on the stage along Ping River, in front of the Chiang Mai Municipality Office. It is estimated that over 100,000 tourists will head to Chiang Mai for the grand festival. The budget for nationwide publicity of the festival would not exceed 70 million baht, reported the Governor Jutamas. This year’s Songkran festival would emphasize Lanna culture and tradition and introduce it to foreigners, said Jutamas. They will also get wet, said the voice of experience. The authorities are saying that they accept the fact that the road toll is too high, and with 50 percent of accidents caused by drivers and riders with blood alcohol levels greater than 0.05 mgm percent, something has to be done. This year, the Probation Department, Ministry of Justice has launched its promotional campaign to control the problem, and bring those who break the law to justice. This is being done through a Drunk don’t Drive Foundation and the Traffic Police Office Headquarters, who are promising tougher application of the relevant laws. According to the Land Traffic Act of 1978, it is illegal for drunken people to drive. The penalties include imprisonment for up to three months and a maximum fine of 10,000 baht. If a drunken driver injures another person, the penalties escalate to up to three years jail and up to 6,000 baht fines. Killing an innocent victim can result in a fine of 20,000 baht and up to 10 years jail. However, this year it is going to be different, say the authorities. Application of the laws will be stricter. As well as fines and jail sentences, convicted drunk drivers will have to carry out community service and attend training courses under the control of the Probation Office and Department, and carryout work such as sweeping the street, cleaning traffic signs, painting traffic signs and street kerbs, helping people cross the road and taking care of road accident victims. What the authorities did not reveal is just how they are going to catch the offenders, before they cause the accidents. How many breathalyzers are held by the police in Chiang Mai? Blood alcohol measurements are not practical as a roadside manoeuvre. Unfortunately “education” promotions have not worked in the past, and threats of community service on top of fines and imprisonment do not look like much of a deterrent. This new tiger has neither teeth nor dentures. Chiang Mai Provincial Revenue Office, Area 1 and the Region 8, Revenue Office has announced they provide on-line services for people who want to submit their personal income tax assessment electronically. This will be convenient for people who have to submit their taxation form before March 31, 2004. The service center is also set up at the city hall, which will be very convenient with fully equipped computers. This service center can save time and expense for many people because formerly people had to submit their taxation forms directly at the provincial and district revenue offices. The on-line computer center is available at three different locations; in front of Chiang Mai City Hall (the old building), Robinson Department stores (Central Airport Plaza) and Tesco Lotus (Kamthieng branch) until March 31, every day from 10 a.m. - 8 p.m.
With finger poised on the button, Prinya Parnthong, Chiang Mai deputy governor, visited the on-line computer service and submitted his personal income tax form last week. Boonmee Sawaengtham, the woman in charge of the Welfare Center Home for Boys, said that the problem of homeless children is an endless conundrum in the capital city of Chiang Mai province. The local Home for Boys is under the supervision of the Ministry of Social Development and Human Security. “To solve this problem, we should start at the family institution since it is very influential and close to the children. It is not easy to control this social problem since homeless or street children from other localities see Chiang Mai as a prosperous place for earning a living and a large number of them head to the city every year,” said Boonmee. The Home provides accommodation, probation, training and education. More than 1,600 children have gone through the center and have become well behaved members of the society, revealed Boonmee. Both government and private sector NGO’s have been cooperating, hoping to reduce and solve the problem. Initially, the provincial authorities have assigned suitable people to work on a campaign on the homeless children problem, with Chiang Mai’s deputy governor as the working group chairman. Others involved in the campaign include the deputy chief of Chiang Mai Administrative Organization, chief of Children, Youth and Women Protection Center; officers from Provincial Police Bureau, Region 5 Office; director of Social Welfare Division, Chiang Mai Municipality; director of Non-Formal Education Center, officers from Social Development and Welfare Office, chief of Welfare Home for Boys, representatives from YMCA, children’s development volunteers, community drama project group and Ban Ua Aree group. The breakdown of the 100 street children living in Chiang Mai shows that only 10 are living at the Home for Boys. There are around 30 selling flower garlands in the city. Of these, some have their own families and go to school, while the others are assigned work by adults who are involved in child slavery and labour. Boonmee said that the Boys Home does not have the authority to arrest these street children, but the police have a legal right to do so and bring the children to the center. “For those who do not have parents we would accept them and willingly take charge of them,” she said. “We take care of them as if they were our own children,” Boonmee said. “If they want to have special tutorial courses on the weekends to make them smarter, we would let them have these just the same as our own children.” Pleasingly, two youths from the Home for Boys are going to graduate with bachelor degrees from Maejo University. YMCA Chiang Mai and the Non-formal Education Center assist them by providing educational opportunities for these children. Tourism Authority of Thailand (TAT) is promoting domestic tourism, in the wake of some recent dampeners on international arrivals, and was behind a road show bringing representatives from southern provinces to Chiang Mai. This month, Phetchaburi, Prachuap Khiri Khan and Ratchaburi tourism enterprises held a road show here in Chiang Mai at Imperial Grand Hall, Imperial Mae Ping Hotel, to persuade Northern people to visit these provinces. 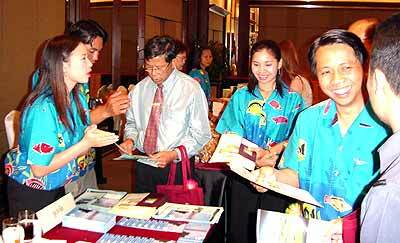 Come visit our seaside resorts, said tourism representatives from the South at the recent road show held at the Imperial Mae Ping Hotel, Chiang Mai. Silachai Surai, director of TAT, Central Office, Region 2 said that this was their second road show in Chiang Mai. The main thrust of the exhibition is to give northern people attractive offers to promote travel to Phetchaburi, Prachuap Khiri Khan and Ratchaburi. Silachai said that the bird flu crisis did not affect the tourism situation in his areas because the numbers of incoming tourists in each province is not too far below last year’s. The road show has been extremely helpful in raising the interest of domestic tourists to each province. Following a trade mission to China, led by Phitsanu Rianmahasan, director of Import Policy Administration Committee Office, together with representatives of longan and lychee orchard owners and gardeners in four northern provinces including Chiang Mai, Lamphun, Chiang Rai and Phayao, it was reported by Wipada Trisat, head of Chiang Mai Provincial Commerce Office that an agreement has been reached with the Chinese authorities. Chinese markets have agreed to import 15,200 tons of dried longan left from last year’s harvest in Thailand. The Thai government, in cooperation with the growers union, will deliver the longan and lychee within the next month to China. Chinese markets decided to import Thai longan and lychee because Thai growers presented product quality guarantees, said Pratuang Narintarangkul na Ayuttaya, president of Saraphi Longan Growers Cooperative Committee, Chiang Mai. The Thai government will jointly invest with the Hong Sheng Company in China to build a cold storage facility in Jinghong (Chiang Rung) that could hold up to 3,000 tons of fresh longan delivered from Chiang Sean district of Chiang Rai before sending them on to China. The Chinese market suggested the Thai government produce the labels in Chinese to serve Chinese customers. Chinese markets also complained that Thai longan price was more expensive than those from other countries. The Thai government replied that even though the price was higher, Thai longan is a better quality product. Direk Konkleeb, Chiang Rai deputy governor, announced that the Hill Tribe Games will take place from June 18-20 this year. Hill tribe athletes will attend from 19 provinces throughout the country, covering Kanchanaburi, Kamphaeng Phet, Chiang Rai, Chiang Mai, Tak, Nan, Phayao, Phitsanulok, Phetchabun, Phrae, Mae Hong Son, Ratchaburi, Lampang, Lamphun, Sukhothai, Suphan Buri and Uthai Thani. The events will include track and field, football, volleyball, Sepak Takraw, Petanque and other traditional competitions. “Hopefully, the games will help promote exercise and good healthy living among hill tribes around the country,” said Direk. Chiang Rai will select Hill Tribe athletes to represent the province at a pre-event competition on March 21 and 22. For more information, please contact the Sports Authority of Thailand, Chiang Rai Provincial Center, or call 053 713 004 and Hill Tribes Development and Welfare Center, Chiang Rai Province or call 01 992 5689. Pol Lt Suchai Kengkarnkha, managing director of Kad Suan Kaew, stated during its 12-year anniversary celebration that the company plans to expand and improve its hotel business and department store. Pol Lt Suchai Kengkarnkha, MD of Kad Suan Kaew shopping park and hotel complex, Chiang Mai. A 200 million baht budget, underwritten by the Krung Thai Bank would be spent on improving its current hotel facilities and constructing a new one. The new hotel will be located on 15 rai of land close to the current hotel complex, and construction is expected to be completed within two years. The new hotel rooms will be on the 10-15th floors of the new building with the lower nine floors used for car parking. Management is confident that the new hotel would be profitable because Chiang Mai has a high potential in tourism with over 2 million tourists annually, bringing much tourist dollar revenue to the city, said the managing director. Phuping Police have arrested two members of the teenage Samurai Gang. They were on the trail of three of the young miscreants, but one is still at large. The gang had followed a victim to his home in Sai Lom Joy village, where they injured a man and stole his motorcycle and possessions. Two Samurai Gang members, Daeng and Ake, shown here with some of the haul and their samurai sword, were charged at Phuping Police station. Pol Col Prachuab Wongsook, superintendent of Phuping Station, commanded the investigation team, led by Pol Capt Jaran Kampa, investigation police deputy inspector, to examine the crime scene and hunt for the criminals. After questioning the witness, police officers knew that the criminals were named Daeng and Ake. One hour later, policemen arrested Thawatchai, or Daeng, at Udomlert Court behind Chiang Mai University, and Nisithi, or Ake, at his rented house on Santitham Road. The officers impounded the stolen motorcycle, a 2 foot long samurai sword and the unregistered motorcycle they used when carrying out the robbery. The two teenage criminals confessed that they took up crime to pay for their football gambling habit. They followed their victim looking for the opportunity to rob him. When they reached the village, they realized the place was deserted, so they called the victim to stop and threatened him with the sword. The frightened victim handed over his possessions and ran, leaving his motorcycle for the criminals. Pol Capt Jaran said that the teen gangsters had been committing crimes two to three times a month, but police had stepped up surveillance and were routinely stopping youngsters on unregistered motorcycles. Swap you a slug for a three toed sloth - if you rush! Chiang Mai Safari Night Zoo is getting ready to stock up on animals and promises species that are not usually seen in Thailand. Animals and wildlife from foreign countries will be brought to Thailand as part of an international animal exchange program. Under this program, species of animals and wildlife from Thailand’s National Park, Wildlife and Plants Department will be sent to participating countries under stringent wildlife exchange rules. Pisarn Wasuwanitch, the inspector-general of the Ministry of Natural Resources and Environment said the exchange program would soon be underway, while construction of Chiang Mai Safari Night Zoo is forging ahead. The Night Zoo progress is 15 percent at present, and within the time frame. Current work includes landscaping and fencing. So far, he indicated that 200 million baht, of the total one billion baht, has been used for the infrastructure. Inspector-General Pisarn said that the animals and wildlife will be brought from Australia and Africa in the main, and the animals selected are expected to live and flourish in the night zoo environment. One hopes so, it would be trifle embarrassing to send them back in a box! Do vendors wear Hush Puppies! Dog meat trade has been rarely discussed within Thai society for many years, but now it may be become the talk of the town, even if not the flavor of the month. Chiangmai Mail reporters had heard about the dog meat trade in Chiang Mai as well, particularly at Ban Tung Siew village. A roadside dog meat BBQ in San Patong district. Going undercover, the puppy reporters carried out a survey in San Patong district, Chiang Mai. First kennel on the block was a house in one soi opposite Tung Siew School, which was reputed to sell dog meat. The owner’s fur was ruffled by our line of questioning and he attempted to remain muzzled. He just said he did not want to get in trouble because he was previously reported as being involved with the dog meat trade. After that, many government officers investigated and kept watch on him. He had to stop his business for a while and lost much income. We noticed that he had two cages that could be used for holding dogs, but he denied this, saying they were for drying lamyai. A fruity excuse. One of his neighbors, however, said that every morning the man had sliced dog meat available at 35 baht per kilogram. 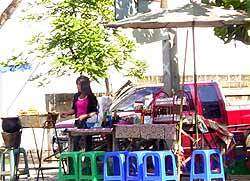 Some villagers and vendors who own small bars and stalls along the roadsides would buy the meat and make it as one recommended specialty in their bars. Dogs being killed were not from San Patong district, said the villager. A trader from Chiang Rai province would deliver the dogs to his house. However, dog meat traders do not kill the dogs in their local areas. They would do it in a forest far from the community areas. During wet season, the smell of dead dogs is very unpleasant, complained the villager. Another villager admitted that dog meat was consumed, but said, “Not all of San Patong villagers eat dog meat, just a minority. It depends on each person’s taste and point of view,” said the local gourmet. The informant added that sometimes dog meat was also available at Ta Karn market in Tung Siew village. There is a popular dish called “Kaeng Muan” or dog curry. Usually, there are two shops selling Kaeng Muan, located close to the Siam Commercial Bank, Tung Siew branch. Kaeng Muan is also usually put in earthen pots that have black bottoms to make it easily recognized by customers. The villager said that when eating dog meat he did not feel as if it was dog. Kaeng Muan did not smell of raw meat because the cooks knew how to prepare it. They use chili, onion, pepper, lemongrass, shrimp paste, herbal plants and other ingredients to make it “aroy maak” and fit for consumption. The official position, taken by the authorities we contacted, was that there have been no reports of dog meat for sale in the district. Not a single bark. That man would eat dog, however, should really come as no surprise. After all, we eat pigs, chickens, cows, sheep, crocodiles, kangaroos, ostriches and lambs. The problem associated with dog meat is that feral dogs carry diseases, just like feral cats or rats. From a public health point of view, the use of dog meat does present a risk. From the villagers’ point of view, dog meat is an inexpensive and plentiful source of protein. Man’s best friend in more ways than one? Ms. Orachorn Rattanamanee, head of Chiang Mai Provincial Employment Services Office, said that they have been informed that brochures have been distributed to people in the Northeast of Thailand purporting to offer well paid jobs as farm laborers in the United States. The brochures claim that there are 2,000 vacancies for agricultural positions in the US and the message is supposedly guaranteed by the Labor Office’s ex-inspector and the Agriculturist Supplement Cooperatives, which is an unknown organization. The con men say they will charge 400,000 baht from a job seeker for services and expenses and the salaries offered are 60,000 baht per month before overtime payments. The term of the contract is said to be three years. The Labor Office says they have no authorization from the American authorities to send people to the US, and prospective employees have to register with the American authorities here first. The office says that job seekers should not believe these people who claim they are agents for employment offices in the United States. You have been warned!